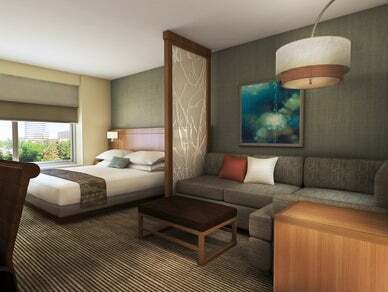 Hyatt Place Glendale Opening in June 2018 with 179 guest rooms prominently situated in Downtown Glendale. Just steps away from the Americana a spectacular outdoor community of upscale shops, entertainment and the famous Glendale Galleria. Minutes from Pasadena and Burbank. •	In the morning experience our complimentary healthy and hearty breakfast menu then in the evening relax in our modern Coffee to Cocktails bar. •	The e-room business center is here for you to use any time of the day or night with free computer access and free Wi-Fi throughout the hotel. •	Our 24 hour Stayfit fitness center is perfect for the exercise enthusiast or you can just relax in our invigorating heated pool. •	Pet-friendly rooms allow your 4 legged companion to travel with you. Hyatt Place is just 10 miles from the Los Angeles Convention Center and a short distance from Universal Studios, Hollywood and Grumman's Chinese Theater and companies like Warner Bros, Walt Disney Studios, IBM and Nestle.